This article is about the fuel-burning heating device. For the fuel-burning cooking device, see Cook stove. For the home appliance, see Kitchen stove. 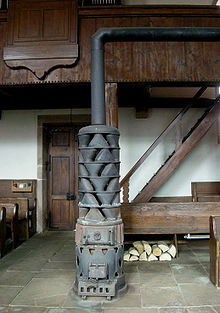 Alsatian stove with large exhaust gas heat exchanger, in Fouday church. A stove is an enclosed space in which fuel is burned to heat either the space in which the stove is situated, or items placed on the heated stove. There are many types of stoves, such as the kitchen stove, which is used to cook food, and the wood-burning stove or a coal stove, which is typically used for heating a dwelling. Due to concerns about air pollution, efforts have been made to improve the stove design over the years. Pellet stoves, for example, are a type of clean-burning stove, and air-tight stoves are another type that burn the wood more completely and therefore reduce the amount of the resulted combustion by-products. Another possibility is the addition of a device to clean the exhaust gas (e.g. filter or afterburner). All wood stoves manufactured In the United States since 1992 are required to limit emission of particulates. The Old English word stofa meant any individual enclosed space, such as a room, and "stove" is still occasionally used in that sense, as in "stoved in". Until well into the 19th century "stove" was used to mean a single heated room, so that Joseph Banks' assertion that he "placed his most precious plants in the stove" or René Descartes' observation that he got "his greatest philosophical inspiration while sitting inside a stove" are not as odd as they first seem. In its earliest attestation, cooking was done by roasting meat and tubers in an open fire. Pottery and other cooking vessels may be placed directly on an open fire, but setting the vessel on a support, as simple as a base of three stones, resulted in a stove. The three-stone stove is still widely used around the world. In some areas it developed into a U-shaped dried mud or brick enclosure with the opening in the front for fuel and air, sometimes with a second smaller hole at the rear. A kitchen stove, cooker, or cookstove is a kitchen appliance designed for the purpose of cooking food. Kitchen stoves rely on the application of direct heat for the cooking process and may also contain an oven underneath or to the side that is used for baking. Traditionally these have been fueled by wood and one of the earliest recorded instances of a wood burning kitchen stove was the so-called stew stove (developed in 1735 by the French designer François de Cuvilliés and officially termed the Castrol Stove). More modern versions such as the popular Rayburn range offer a choice between using wood or gas. The most common stove for heating in the industrial world for almost a century and a half was the coal stove that burned coal. Coal stoves came in all sizes and shapes and different operating principles. Coal burns at a much higher temperature than wood, and coal stoves must be constructed to resist the high heat levels. A coal stove can burn either wood or coal, but a wood stove might not burn coal unless a grate is supplied. The grate may be removable or an "extra". This is because coal stoves are fitted with a grate so allowing part of the combustion air to be admitted below the fire. The proportion of air admitted above/below the fire depends on the type of coal. Brown coal and lignites evolve more combustible gases than say anthracite and so need more air above the fire. The ratio of air above/below the fire must be carefully adjusted to enable complete combustion. Compared to simple open fires, enclosed stoves can offer greater efficiency and control. In free air, solid fuels burn at a temperature of only about 240 °C (464 °F), which is too low a temperature for perfect combustion reactions to occur, heat produced through convection is largely lost, smoke particles are evolved without being fully burned and the supply of combustion air cannot be readily controlled. By enclosing the fire in a chamber and connecting it to a chimney, draft (draught) is generated pulling fresh air through the burning fuel. This causes the temperature of combustion to rise to a point (600 °C or 1,112 °F) where efficient combustion is achieved, the enclosure allows the ingress of air to be regulated and losses by convection are almost eliminated. It also becomes possible, with ingenious design, to direct the flow of burned gasses inside the stove such that smoke particles are heated and destroyed. Enclosing a fire also prevents air from being sucked from the room into the chimney. This can represent a significant loss of heat as an open fireplace can pull away many cubic metres of heated air per hour. Efficiency is generally regarded as the maximum heat output of a stove or fire, and is usually referred to by manufacturers as the difference between heat to the room and heat lost up the chimney. An early improvement was the fire chamber: the fire was enclosed on three sides by masonry walls and covered by an iron plate. 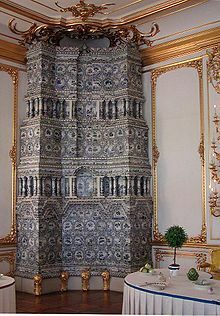 Only in 1735 did the first design that completely enclosed the fire appear: the Castrol stove of the French architect François de Cuvilliés was a masonry construction with several fireholes covered by perforated iron plates. It is also known as a stew stove. Near the end of the 18th century, the design was refined by hanging the pots in holes through the top iron plate, thus improving heat efficiency even more. In 1743, Benjamin Franklin invented an all-metal fireplace with an attempt to improve the efficiency. It was still an open-faced fireplace, but improved on efficiency compared to old-fashioned fireplaces. Some stoves use a catalytic converter, which causes combustion of the gas and smoke particles not previously burned. Other models use a design that includes firebox insulation, a large baffle to produce a longer, hotter gas flow path. Modern enclosed stoves are often built with a window to let out some light and to enable the user to view progress of the fire. While enclosed stoves are typically more efficient and controllable than open fires, there are exceptions. The type of water-heating "back boiler" open fires commonly used in Ireland, for instance, can achieve more than 80% absolute efficiency. 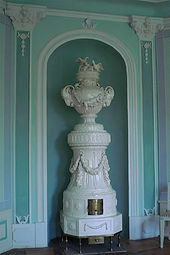 Tile stove (for heating) in the dining room of the Catherine Palace, Saint Petersburg. Masonry heaters were developed to control air flow in stoves. A masonry heater is designed to allow complete combustion by burning fuels at full-temperature with no restriction of air inflow. Due to its large thermal mass the captured heat is radiated over long periods of time without the need of constant firing, and the surface temperature is generally not dangerous to touch. Metal stoves came into use in the 18th century. An early and famous example of a metal stove is the Franklin stove, said to have been invented by Benjamin Franklin in 1742. It had a labyrinthine path for hot exhaust gases to escape, thus allowing heat to enter the room instead of going up the chimney. The Franklin stove, however, was designed for heating, not for cooking. Benjamin Thompson at the turn to the 19th century was among the first to present a working metal kitchen stove. His Rumford fireplace used one fire to heat several pots that were also hung into holes so that they could be heated from the sides, too. It was even possible to regulate the heat individually for each hole. His stove was designed for large canteen or castle kitchens, though. It would take another 30 years until the technology had been refined and the size of the iron stove been reduced enough for domestic use. Philo Stewart's Oberlin stove was a much more compact, wood-burning cast-iron stove, patented in the United States in 1834. It became a huge commercial success with some 90,000 units sold in the next 30 years. In Europe, similar designs also appeared in the 1830s. In the following years, these iron stoves evolved into specialised cooking appliances with flue pipes connected to the chimney, oven holes, and installations for heating water. The originally open holes into which the pots were hung were now covered with concentric iron rings on which the pots were placed. Depending on the size of the pot or the heat needed, one could remove the inner rings. As concerns about air pollution, deforestation, and climate change have increased, new efforts have been made to improve stove design. The largest strides have been made in innovations for biomass burning stoves, such as the wood burning stoves used in many of the most populous countries. These new designs address the fundamental problem that wood and other biomass fires inefficiently consume large amounts of fuel to produce relatively small amounts of heat, while producing fumes that cause significant indoor and environmental pollutants. The World Health Organization has documented the significant number of deaths caused by smoke from home fires. Increases in efficiency mean that a stove's users can spend less time gathering wood or other fuels, suffer less emphysema and other lung diseases prevalent in smoke-filled homes, while reducing deforestation and air pollution. Corn and pellet stoves and furnaces are a type of biofuel stove. The shelled dry kernel of corn, also called a corn pellet, creates as much heat as a wood pellet, but generates more ash. "Corn pellet stoves and wood pellet stoves look the same from the outside. Since they are highly efficient, they don't need a chimney; instead, they can be vented outdoors by a four-inch (102 mm) pipe through an outside wall and so can be located in any room in the home." A pellet stove is a type of clean-burning stove that uses small, biological fuel pellets which are renewable and very clean-burning. Home heating using a pellet stove is an alternative currently used throughout the world, with rapid growth in Europe. The pellets are made of renewable material — typically wood sawdust or off-cuts. There are more than half a million homes in North America using pellet stoves for heat, and probably a similar number in Europe. The pellet stove typically uses a feed screw to transfer pellets from a storage hopper to a combustion chamber. Air is provided for the combustion by an electric blower. The ignition is automatic, using a stream of air heated by an electrical element. The rotation speed of the feeder and the fan speeds can be varied to modulate the heat output. Other efficient stoves are based on Top Lit updraft (T-LUD) or wood gas or smoke burner stove, a principle applied and made popular by Dr. Thomas Reed, which use small pieces of sticks, chips of wood or shavings, leaves, etc., as fuel. The efficiency is very high — up to 50 percent — as compared to traditional stoves that are 5 to 15 percent efficient on average. Stoves fueled by alcohol, such as ethanol, offer another modern, clean-burning stove option. Ethanol-fueled stoves have been made popular through the work of Project Gaia in Africa, Latin America and the Caribbean. 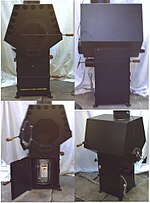 The pentagonal self-cleaning wood stove, is an EPA style secondary combustion air wood stove with a fan forced heat exchanger, thermostat, outside air intake with throttle, shakers, and ash drop for easy cleanup. An air-tight stove is a wood-burning stove designed to burn solid fuel, traditionally wood, in a controlled fashion so as to provide for efficient and controlled fuel use, and the benefits of stable heating or cooking temperatures. They are made of sheet metal, consisting of a drum-like combustion chamber with airflow openings that can be open and shut, and a chimney of a metre or more length. These stoves are used most often to heat buildings in winter. Wood or other fuel is put into the stove, lit, and then air flow is regulated to control the burn. The intake airflow is either at the level where fuel is added, or below it. The exhaust (smoke) from the stove is usually several metres above the combustion chamber. Most modern air-tight stoves feature a damper at the stove's outlet that can be closed to force the exhaust through an after burner at the top of the stove, a heated chamber in which the combustion process continues. Some air-tight stoves feature a catalytic converter, a platinum grid placed at the stove outlet to burn remaining fuel that has not been combusted, as gases burn at a much lower temperature in the presence of platinum. Using an air-tight stove initially requires leaving the damper and air vents open until a bed of coals has been formed. After that, the damper is closed and the air vent regulated to slow down the burning of the wood. A properly loaded and controlled air-tight stove will burn safely without further attention for eight hours, or longer. These features provide a more complete combustion of wood and elimination of polluting combustion products. It also provides for regulation of the intensity of fire by limiting air flow, and for the fire to create a strong draught or draw up the chimney. This results in highly efficient fuel usage. Air-tight stoves are a more sophisticated version of traditional wood-burning stoves. Many countries legislate to control emissions. Since 2015, the Phase III EPA Woodstove Regulations in the United States require that all wood stoves being manufactured limit particulate emission to 4.5 grams per hour for stoves with after burners or 2.5 grams per hour for stoves with catalytic converters. The burn temperature in modern stoves can increase to the point where secondary and complete combustion of the fuel takes place. A properly fired masonry heater has little or no particulate pollution in the exhaust and does not contribute to the buildup of creosote in the heater flues or the chimney. Some stoves achieve as little as 1 to 4 grams per hour. This is roughly 10% as much smoke than older stoves, and equates to nearly zero visible smoke from the chimney. This is largely achieved through causing the maximum amount of material to combust, which results in a net efficiency of 60 to 70%, as contrasted to less than 30% for an open fireplace. Net efficiency is defined as the amount of heat energy transferred to the room compared to the amount contained in the wood, minus any amount central heating must work to compensate for airflow problems. The search for safer, cleaner stoves remains to many an important if low-profile area of modern technology. Cook stoves in common use around the world, particularly in Third World countries, are considered fire hazards and worse: according to the World Health Organization, a million and a half people die each year from indoor smoke inhalation caused by faulty stoves. An engineer's "Stove Camp" has been hosted annually since 1999 by Aprovecho Research Center (Oregon, US) with the intent of designing a cheap, efficient, and healthy cook stove for use around the world. Other engineering societies (see Envirofit International, Colorado, US) and philanthropic groups (see the Bill & Melinda Gates Foundation, California) continue to research and promote improved cook stove designs. A focus on research and development on improved heating stoves is ongoing and was on display at the 2013 Wood Stove Decathlon in Washington, D.C.
^ Bryden, Mark; Still, Dean; Scott, Peter; Hoffa, Geoff; Ogle, Damon; Bailis, Rob; Goyer, Ken. "Design Principles For Wood Burning Cookstoves" (PDF). Aprovecho Research Center. Archived (PDF) from the original on January 4, 2012. Retrieved October 18, 2011. ^ a b "Indoor air pollution and household energy". World Health Organization. Archived from the original on January 30, 2014. Retrieved October 18, 2011. ^ "corn pellet stove". The Encyclopedia of Alternative Energy and Sustainable Living. Archived from the original on October 20, 2011. Retrieved October 18, 2011. ^ a b c Bilger, Burkhard. "Hearth Surgery: The Quest for a Stove That Can Save the World". The New Yorker. Condé Nast (21 & 28 December 2009): 84–97. Archived from the original on 5 December 2010. Retrieved 2010-11-21. ^ StoveTec. "Not All Stoves Are Created Equal". Aprovecho.net. Archived from the original on 2010-12-03. Retrieved 2010-11-21. ^ "The Alliance for Green Heat – 2013 Wood Stove Decathlon". www.forgreenheat.org. Archived from the original on 15 July 2017. Retrieved 6 May 2018. Wikimedia Commons has media related to Stove. Look up stove in Wiktionary, the free dictionary.